Even though the UCLA Bruins were undefeated and ranked 9th in the Nation, some Bruins fans were NOT feeling confident before kickoff on Saturday. For one thing, the Bruins’ three most crucial Defensive Players, Myles Jack, Eddie Vanderdoes, and Fabian Moreau, were all declared lost for the entire season. Secondly, phenom QB Josh Rosen had gotten progressively worse in his first three games. And finally, two of the teams the Bruins beat to rise to #9, Virginia and BYU, both got obliterated this week, a lot worse than how UCLA topped them. So with all that in mind, the Bruins were vulnerable to an upset in Tucson. 3-point underdog Arizona had lost three straight to the Bruins, and were amped up for revenge; The Cats had won all 3 of their games easily this year; The ESPN crew was on hand for a National “Game Day” broadcast, so the fans were raucous and plentiful; and the Cats were getting back their best player, Linebacker Scooby Wright. But these are not your Daddy’s Bruins. Nor are they Jerry Neuheisel’s Daddy’s Bruins. After a quick, long opening TD drive by Arizona that gave the Cats an early 7-0 lead, UCLA erupted for 28 straight points. 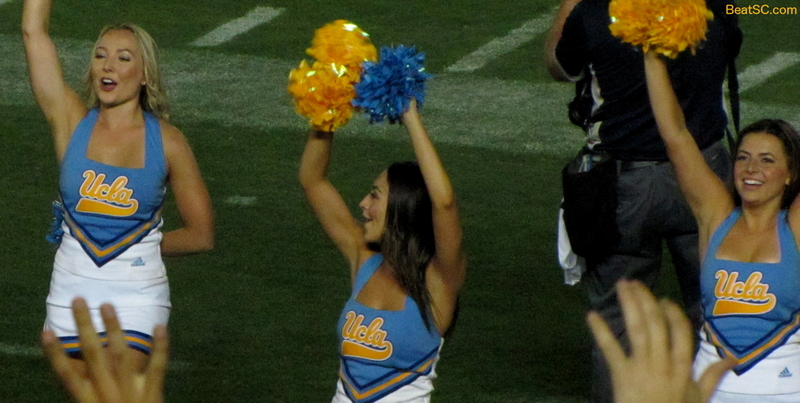 Behind nifty running by Paul Perkins, pinpoint passing by Josh Rosen, clutch catches by Jordan Payton, who was battling an injured ankle, and most importantly, a powerful performance of Run Blocking and Pass Blocking by the Offensive Line, UCLA was unstoppable, finally firing on all cylinders. The Bruins didn’t really need any help, but they got LOTS of it from the Wildcats. Zona had a snap go over the QB’s head (recovered by Deon Hollins, who actually recovered TWO fumbles), several other high snaps that disrupted plays, an Interception (by Ishmael Adams), and a fumble caused by a Running Back knocking the ball away from the Quarterback. The Bruins capitalized on these mistakes repeatedly, scoring TD’s on 6 of 7 first half possessions, getting TD’s every time they were in the Red Zone. Also helping was Arizona’s horrible tackling, although the great Bruin blocking and fine stable of Running Backs tend to make most Defenses look bad. The Bruins were a much-improved 11-15 on 3rd Downs. Perkins gained 85 yards and scored 3 times, Nathan Starks scored once, Soso Jamabo gained 96 yards and scored once, and Josh Rosen even ran for a score. Rosen also threw for 284 yards and 2 TD’s — the first one an amazing one-handed grab and run by Thomas Duarte, and the second one to Jordan Payton, who ended with 7 catches for 136 yards. 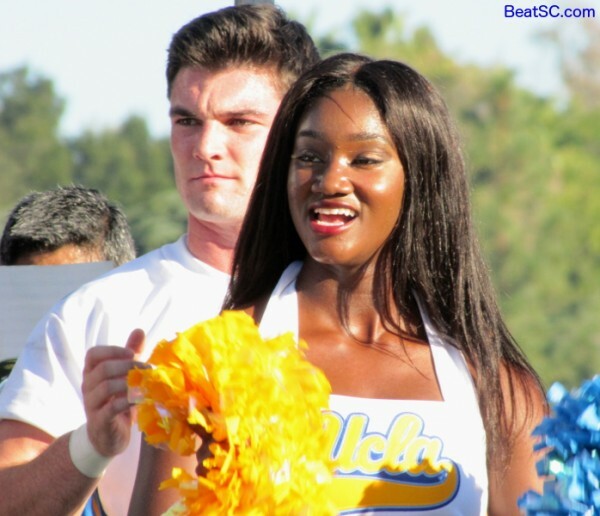 But if you are more of a CRITICAL fan, always looking for ways UCLA needs to improve to be a Conference Champion and National Playoff Contender, there was one thing. With the score 28-7, the UA QB banged his head on a tackler’s leg, and exited the game for the night. A back-up QB came in who was a dual-threat QB, with wicked running skills, and the Bruins had serious difficulty adjusting to this. The Cats continually ran the Read Option, and the Running Back and Quarterback ran roughshod over the Bruin Defense, who suddenly looked vulnerable without Vanderdoes and Jack plugging up the interior running lanes. Defensive Coordinator Tom Bradley has earned a lot of National respect over the years, so I’m thinking that he had his team prepared for the Starting QB, and if he knew he would be facing the Read Option, the Defense would have looked a lot better. The radical change in attack was just too much to adjust to on the fly, especially while missing the top 3 starters and breaking in new people in new places (like Randall Goforth moving from Safety to Cornerback, and Adams returning to Nickel Back). Luckily for the Bruins, the new UA QB had no touch on his passes, and the Cat staff asked him to throw too much. His aerial mistakes allowed the Bruin D to hang on, and not relinquish much of their lead. The Bruins were up 56-23, when Zona scratched out a late, meaningless TD against the Bruin back-ups to make the final margin “only” 26 — 2 less than at Halftime. Future opponents will go to school on this performance, and if they have QB’s who can run, that option will be utilized frequently, as defending it appears to be a Bruin weakness. Luckily, SC’s Kessler is not a threat to run at all. SC destroyed ASU Saturday night, so they will be a big obstacle to UCLA’s Title aspirations. So will Utah, who killed the Ducks IN Oregon on Saturday night, and the Utes’ QB CAN use his legs effectively. So Bradley will have to gameplay against that, or UCLA will not reach its lofty goals this year. 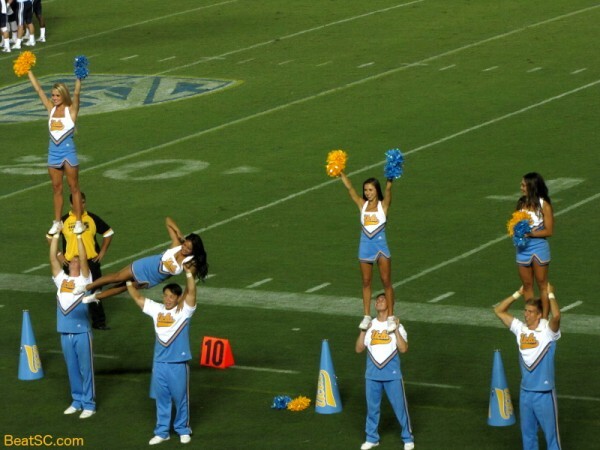 Watching on TV, it looked like the Bruins had only the Cheer Squad to support them in Tucson, with the Dance Team not making the trip. I’m sorry those 13 lovely students missed this epic fun, but I’m sure they didn’t miss the 97-degree heat at Kickoff. I’m sure both units will be in attendance when ASU comes to the Rose Bowl this Saturday, and I can’t wait to be there too, to capture all their beauty and grace for you. Until then, I still have more from the BYU game. Here are 43 more mostly “B-level” shots of “A+-level” girls. 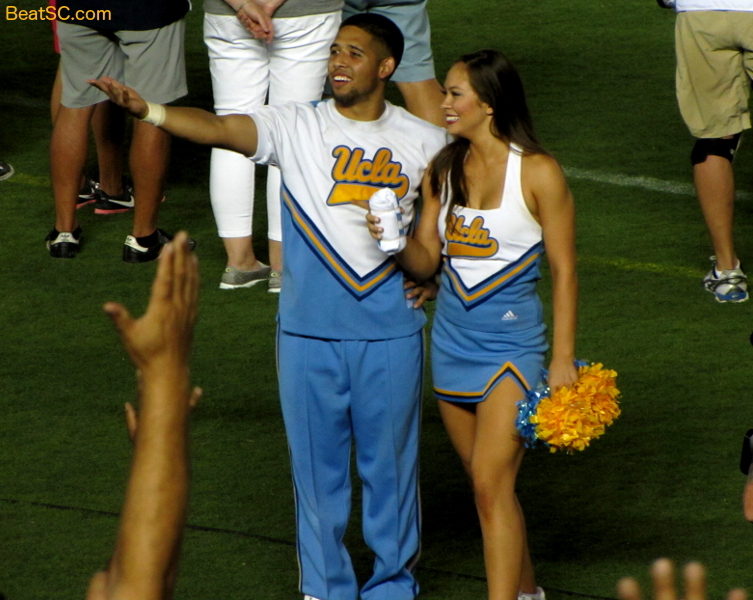 "BRUINS TREAT ‘CATS LIKE A MINNESOTA DENTIST" was published on September 27th, 2015 and is listed in Blue & Gold News, UCLA/usc/Cheerleader Photos. It was a good day. I loved how we answered UA’s opening drive with a TD and never looked back after that. Granted UA coughed up the ball a few times but we took advantage of the turnovers. We also had two interceptions called back because of penalties. Time to get ready for ASU. In spite of the Sun Devils stinking it up against sc, it’s going to be a tough football game. Bring it on! GO BRUINS! Nice road win by the Bruins, who showed the very important ability to take advantage of opponents mistakes, but count me among the “critical”; because, make no mistake about it, Az, who had beaten NO ONE, was vastly overrated AND lost a starting QB AND turned the ball over 4x in the first half. So not only was our inability to adjust and defense the read option very concerning, but our regression to frequent penalties and pathetic tackling skills is extremely troubling. I mean, Kenny Young may be our best remaining tackler, and his jock is still somewhere out there on the Arizona field. I trust Mora and Bradley will be revisiting defensive/tackling fundamentals this week, because despite the misleading final score last night, if we’re to win our remaining games, we’ll have to play much better.